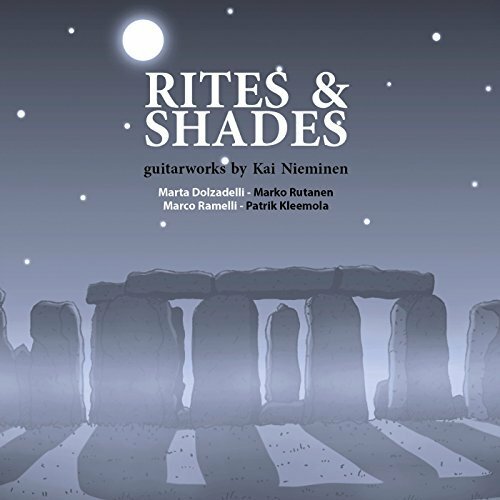 ”Shades… around Stonehenge ruins” is an ambitious solo guitar work by Kai Nieminen in four movements that illustrates his poetic vision of the instrument. Through his writing, the guitar is an extremely versatile instrument, rich in colour shades, able to imitate the sounds of nature, all with a rich palette of dynamics. In March 2016, Kai sent me the first draft of the work, a process that lasted more than one year begun, where I had the pleasure to work in a rare synergy with him throughout the process. During the year, we had the opportunity to further explore the polyphonic and timbre potential of the instrument, bringing new ideas to the piece, which increased the dramatic output of the finalised score. The published version is for us a testimony of true collaboration. The four-movement Sonata-Fantasia is inspired by the composer’s night visit to the prehistoric monument of Stonehenge, in Wiltshire, UK. Although divided into movements, the composition should be considered as a single flow. Melodic and rhythmical elements are developing throughout the piece. As characters of a story, some elements disappear and reappear transformed, as the piece unfolds in a new atmosphere. The required scordatura of (Eb Ab d g bb e’) gives the composition a dark, mysterious colour, ideal to represent its many ‘shades’. 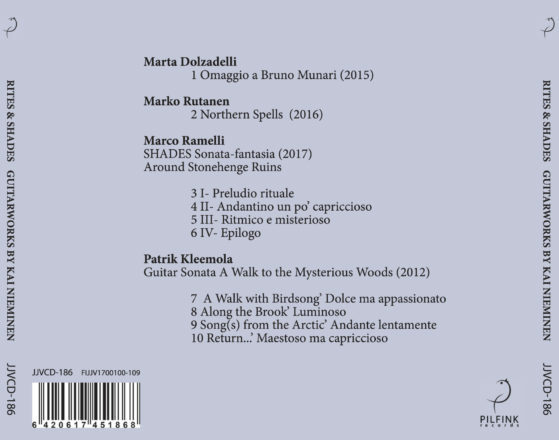 The first section, ’Preludio rituale’, requires an improvisatory approach capable of turning the guitar into a ritual instrument, like the drum the Scandinavian shaman uses to tell stories. In this movement, there is a continuing contrast between two elements; the percussive and cryptic trill in the bass register, and the crystalline sound of the high overtones. Fast arpeggios distinguish the second movement, ’Andantino un poco capriccioso’. The flow of the arpeggios, often interrupted by violent chords, always returns more intense, like the water of the river, finally converged in a ’quasi cadenza’ section where a theme from the first movement is repeated and then deconstructed. The rhythmical element characterises the third movement, rich in counterpoint and virtuosity. The bass line, like a tambourine, guides this dance. The flow of the music is interrupted by a percussive element that recalls the shamanic tambourine and by virtuosic cadences that recall the singing of Redwings (Turdus ilaiacus) a bird widespread in northern Europe. The last movement is an epilogue that opens with calm chords, the composer evoking the sound of the church bells of the village of his youth. The main elements of the composition appear for the last time in a quieter and resigned atmosphere.